Today’s Around the Town Thursday post focuses on a location not far from my house. 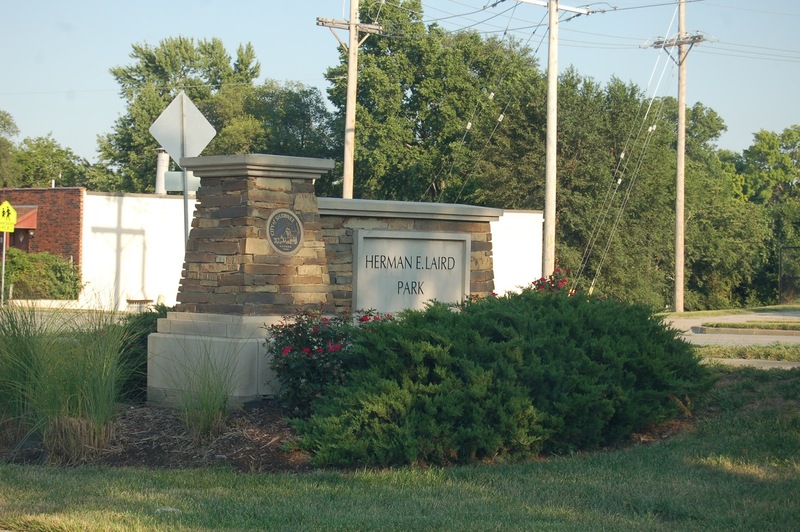 I can’t recall the number of times I’ve driven past Herman E. Laird Park without stopping. There are many wonderful aspects of the park: tennis courts, a playground, a picnic area and at the edge of the park boundaries sits Old Shawnee Town, a prominent Shawnee, Kansas living history site but the portion of the park I’m choosing to focus on for this post is a statue in the corner of the park. You can see the statue while driving on Johnson Drive, the main thoroughfare the park sits on. And I’ve always wondered what the purpose of the statue was, so I decided to find out. The plaque in front of the statue gives visitors a basic idea of who Chief Charles Bluejacket was. Shawnee tribal chief, military captain, farmer, minister and interpreter. But that’s never the whole story, is it? Charles Bluejacket was born on the banks of the Huron River in Michigan in 1817. His family moved to Piqua, Ohio soon after his birth and his early education was received from a Quaker School in Piqua. Following the family’s move to Kansas in 1833 (part of the Indian removal), his education continued in mission schools in Kansas. He also farmed and did missionary work with the Shawnees for the Methodist church. He was a student of the Shawnee culture and worked hard to pass the customs and teachings of the Shawnee to others. Bluejacket eventually became a Methodist minister and joined a local Masonic Lodge in Shawnee. In the years leading up to the Civil War, Bluejacket became a successful farmer, trusted interpreter for the government, and well-respected local businessman and leader. He eventually became chief of the Shawnee Tribe during the period of time when Kansas became a state and the Civil War broke out. There is a very interesting essay here that talks about Charles Bluejacket and has an interesting bit about his daughter-in-law defending herself and her home against one of Quantrill’s raiders. It’s well worth the read (and if the story is true, I confess, I wouldn’t mind meeting Bluejacket’s daughter-in-law!). Bluejacket served as chief of the Shawnee Tribe for three years. Soon after, the Indians were once again removed from their lands, this time into Oklahoma in 1869. Bluejacket’s story doesn’t stop with his move to Indian Territory. He was a natural born leader and the location he settled near in Oklahoma eventually became a bustling community, thanks to the railroad. A post office was opened bearing his name in 1882 with Bluejacket serving as postmaster. He also served as the Methodist minister in that locale for a time. When the town finally became incorporated, the name Blue Jacket was chosen for the town. and of children for their father is evident in the sculpture. The park statue shows Bluejacket reading to two of his twenty-three children. It’s said he enjoyed spending time reading to his children. In my research I discovered that near his death, he made a trip back to Kansas City from Oklahoma to try and find the grave of The Prophet Tecumseh. He was unsuccessful in finding the grave as he became ill. Returning to his home in Oklahoma, he soon passed away and was buried in the Blue Jacket, Oklahoma cemetery; on land which he donated to the Methodist church with full Masonic service. His funeral was among the largest ever seen in that area. I believe I’d like to visit Blue Jacket, Oklahoma one day and visit Chief Bluejacket’s gravesite. Everything I’ve read has indicated Chief Bluejacket to be a kind, generous, intelligent and honorable man. How great to think he lived in my area. As a side note, in my research, I also ran across information stating that Chief Bluejacket’s father (who was a prominent war chief for the Shawnee Tribe) was actually a white man by the name of Marmaduke Van Swearingen who had been born in Virginia, abducted as a teenager and indoctrinated into the Shawnee Tribe. It’s highly likely that this is nothing more than a myth, as DNA testing has been done on descendants of both Van Swearingen and Bluejacket and the DNA doesn’t match.